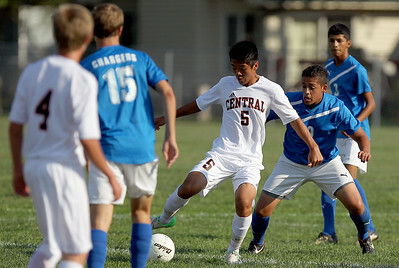 Sarah Nader - snader@shawmedia.com Dundee-Crown's Jose Angeles brings the ball down field during the first half of Tuesday's game against Crystal Lake Central in Crystal Lake on August 28, 2012. 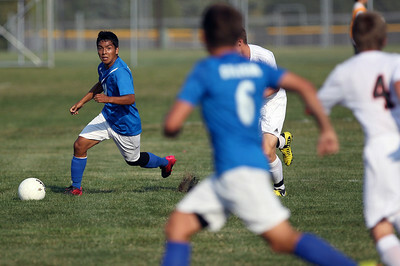 Dundee-Crown won, 3-0. Sarah Nader - snader@shawmedia.com Crystal Lake Central's Michael Chen (center) brings the ball down field during the first half of Tuesday's game against Crystal Lake Central in Crystal Lake on August 28, 2012. Dundee-Crown won, 3-0. 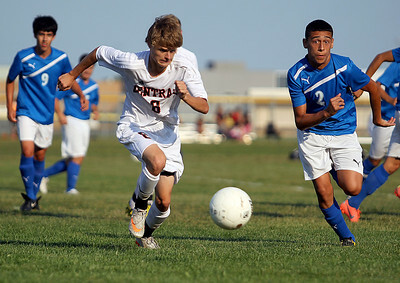 Sarah Nader - snader@shawmedia.com Dundee-Crown's Franco Nestor (right) races up to Crystal Lake Central's Scott Benhart as he kicks the ball down field during the first half of Tuesday's game in Crystal Lake on August 28, 2012. Dundee-Crown won, 3-0. 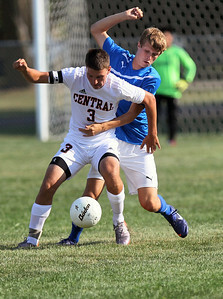 Sarah Nader - snader@shawmedia.com Crystal Lake Central's Chris Struck (left) and Dundee-Crown's Ben Stone fight for control of the ball during the first half of Tuesday's game in Crystal Lake on August 28, 2012. Dundee-Crown won, 3-0. Sarah Nader - snader@shawmedia.com Crystal Lake Central's Matthew Ferris (left) and Dundee-Crown's Alex Ramirez try to keep the ball in bounds during the first half of Tuesday's game in Crystal Lake on August 28, 2012. Dundee-Crown won, 3-0. 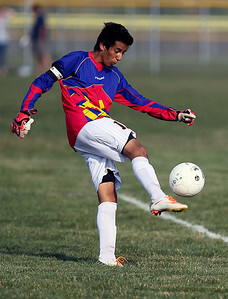 Sarah Nader - snader@shawmedia.com Crystal Lake Central's goalie Luis Medina kicks the ball to his teammates during the first half of Tuesday's game against Dundee-Crown in Crystal Lake on August 28, 2012. Dundee-Crown won, 3-0. 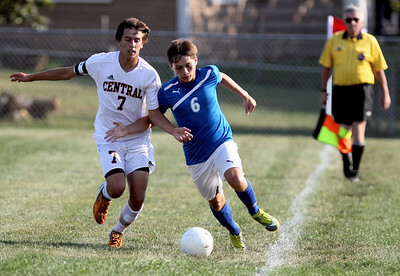 Sarah Nader - snader@shawmedia.com Dundee-Crown's Franco Nestor (right) races up to Crystal Lake Central's Scott Benhart as he brings the ball down field during the first half of Tuesday's game in Crystal Lake on August 28, 2012. Dundee-Crown won, 3-0. Sarah Nader - snader@shawmedia.com Dundee-Crown's Ben Stone heads the ball during the first half of Tuesday's game against Crystal Lake Central in Crystal Lake on August 28, 2012. Dundee-Crown won, 3-0. 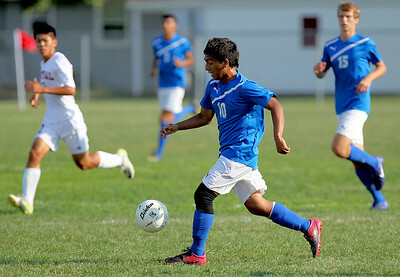 Dundee-Crown's Jose Angeles brings the ball down field during the first half of Tuesday's game against Crystal Lake Central in Crystal Lake on August 28, 2012. 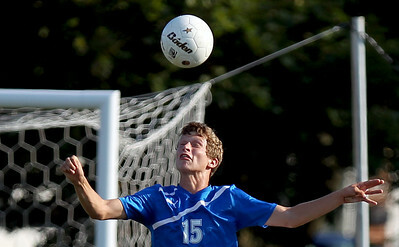 Dundee-Crown won, 3-0.